Success would confirm fundamental physical theories and open a new window on the Universe, enabling scientists to probe the moment of creation itself. GEO 600 is working alongside a US project known as Ligo (Laser Interferometer Gravitational Wave Observatory). It may also be joined in the hunt by an Italian lab within a year. A confirmed detection would require the super-sensitive equipment at more than one of these widely spaced facilities to record an event simultaneously. Compelling independent corroboration would come from a spacecraft that can see the burst of gamma-ray radiation expected to accompany the cataclysmic events that produce gravitational waves. "If there is a supernova in our vicinity during the next couple of months, our chances of detecting and measuring the resulting gravitational waves are good," said Professor Karsten Danzmann, head of the International Centre for Gravitational Physics, which is jointly run by the Max Planck Society and the University of Hanover. 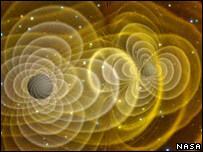 "The first step towards gravitational wave astronomy has been taken." 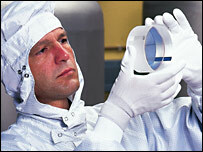 Researchers are extremely confident they now have the technology to detect gravitational waves. Observatories such as GEO 600 bounce lasers down long tunnels, hoping to pick up the fantastically small disturbances the waves should generate as they pass through the Earth. Unlike electromagnetic waves - the light seen by traditional telescopes - gravitational waves are extremely weak. If one were to pass through the Earth it would alternately stretch its space in one dimension while squashing it in another; but the changes are tiny. Laser interferometers are looking for disturbances in their experimental set-ups that are equivalent to mere fractions of the diameter of a proton, one of the particles that make up the nucleus of an atom. Getting GEO 600 to approach this level of sensitivity has been an immense challenge. "There's more to come from GEO 600; I think we're still about a factor of three away from the design sensitivity over part of the frequency range. But the sensitivity we have makes it very worthwhile stopping improvement to run for an extended period," said Professor Jim Hough, from the Institute for Gravitational Research at Glasgow University, UK. "I think the most likely event for us to detect at the moment are coalescing black holes. I'm extremely confident," he told BBC News. A detection would be a final test of Albert Einstein's General Theory of Relativity. It would also usher in a new type of astronomy - one that is not dependent on the observation of light. This is necessary because most of the cosmos is "dark"; the majority of its matter cannot be seen with traditional telescopes. The new approach would also give scientists the opportunity to probe the Universe's earliest moments, by observing the remnant gravitational waves from the Big Bang that should still pervade all space. This, however, will require the super-sensitive laser technology to be launched on satellites high above the Earth. Just such as project, known a Lisa (Laser Interferometer Space Antenna), is being developed currently by the US and European space agencies. Even before then, spacecraft may have an important role to play in corroborating ground-based observations of gravitational waves. 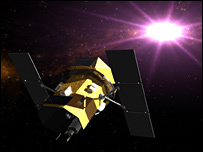 Satellites such as Nasa's Swift telescope can see the high-energy radiation bursts that are produced when there is an extreme event of the type that might also produce detectable gravitational waves. A Swift alert would tell the GEO 600 team to take particular note of any anomalous signal in its data. "It's very exciting that short gamma-ray bursts are probably due to the same sorts of sources," explained Professor Hough. "Immediately there's a gamma-ray burst, there's huge interest in what's happening in the gravitational wave detectors."